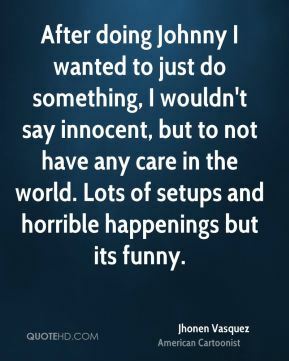 After doing Johnny I wanted to just do something, I wouldn't say innocent, but to not have any care in the world. Lots of setups and horrible happenings but its funny. 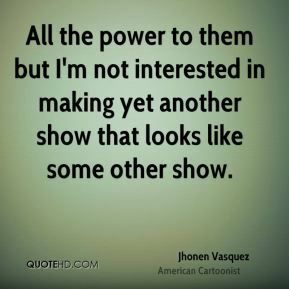 All the power to them but I'm not interested in making yet another show that looks like some other show. 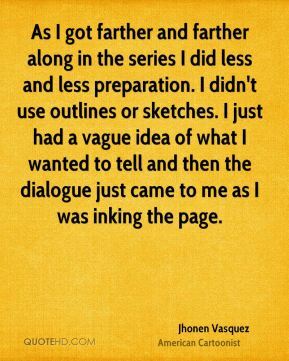 As I got farther and farther along in the series I did less and less preparation. I didn't use outlines or sketches. I just had a vague idea of what I wanted to tell and then the dialogue just came to me as I was inking the page. At this very moment I'm behind on a compilation that Slave Labor is doing for Free Comic Book Day. 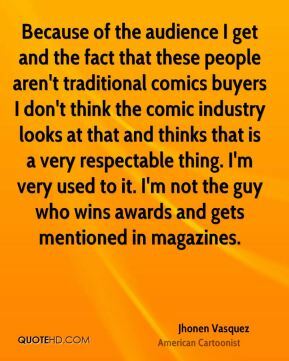 Because of the audience I get and the fact that these people aren't traditional comics buyers I don't think the comic industry looks at that and thinks that is a very respectable thing. I'm very used to it. I'm not the guy who wins awards and gets mentioned in magazines. But I couldn't draw as fast as she requested. Thus, I tried to create the worst abomination of a comic that I could, so as to make her not want comics anymore. 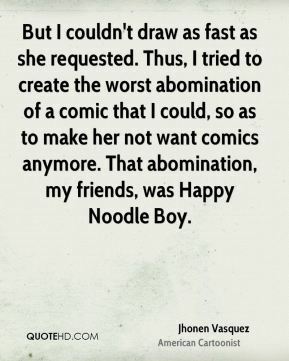 That abomination, my friends, was Happy Noodle Boy. Ever since I'm done with Zim everyone thinks that I'm going to go back to comics. 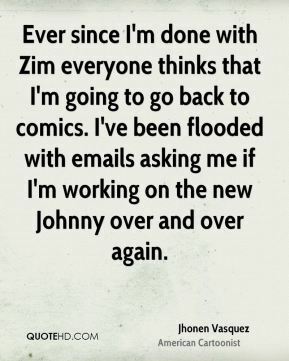 I've been flooded with emails asking me if I'm working on the new Johnny over and over again. 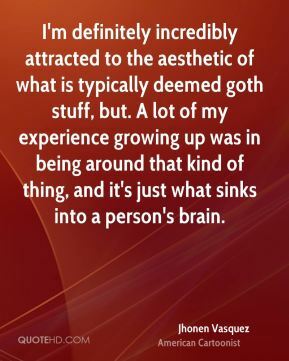 Goth culture, as mired in the past as it is, even it goes through changes, so Goth when I was growing up is not what it is now. When I think of Goth culture as it is at the moment I think of mall culture. 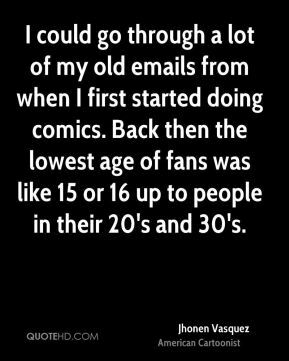 I could go through a lot of my old emails from when I first started doing comics. Back then the lowest age of fans was like 15 or 16 up to people in their 20's and 30's. 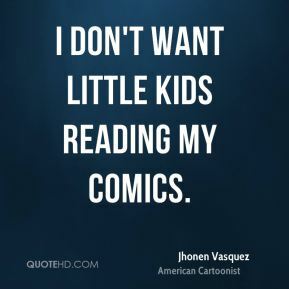 I don't want little kids reading my comics. 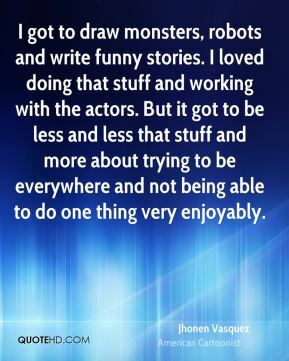 I got to draw monsters, robots and write funny stories. I loved doing that stuff and working with the actors. But it got to be less and less that stuff and more about trying to be everywhere and not being able to do one thing very enjoyably. I love the show and a lot of what came out of it, like some of the people I met and got to work with, but those were truly some of the unhappiest days of my life. 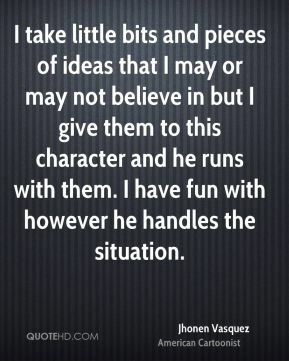 I take little bits and pieces of ideas that I may or may not believe in but I give them to this character and he runs with them. I have fun with however he handles the situation. 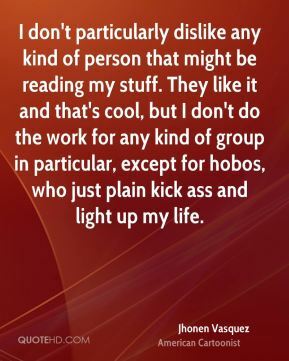 I think there is something a little too self conscious about enjoying being an outsider. I'm definitely incredibly attracted to the aesthetic of what is typically deemed goth stuff, but. A lot of my experience growing up was in being around that kind of thing, and it's just what sinks into a person's brain. It's sort of what the Johnny and Devi stories are about, the idea of always being a slave to something. Retro looking stuff but a lot of these guys doing these shows are my age or younger. I was just disgusted. I hated being around that kind of thing. 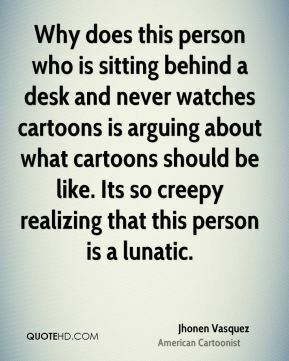 Not that it affected what I did because when it comes down to it I was doing my own show. 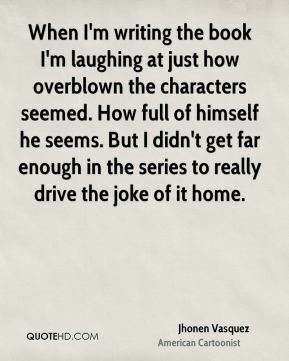 When I'm writing the book I'm laughing at just how overblown the characters seemed. How full of himself he seems. But I didn't get far enough in the series to really drive the joke of it home.